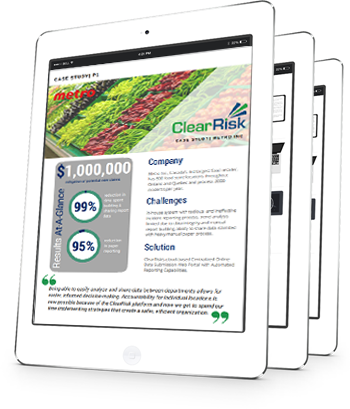 ClearRisk Case Study: Metro Inc. Being able to quickly review relevant data to analyze and share necessary information between departments allows for timely, informed decision-making. Accountability for individual locations is now possible because of the ClearRisk platform and now we get to focus more time implementing strategies that create a safer, efficient organization. Joanne Penney – Risk Manager, Insurance and Claims, Metro Inc. Receive the Case Study Now!